When you visit Strokestown House, not far from Ballyfin, the first thing you wonder is, Is this what Ballyfin would have looked like if a pair of wealthy Americans hadn’t rescued it? Strokestown was never as grand as Ballyfin. But it was pretty grand. Built by Thomas Mahon in the early 18th century, it was a palladian mansion (meaning the architecture was of the European style derived from the designs of the 16th century Venetian architect Andrea Palladio). But in talking about the differences between Ballyfin and Strokestown, I’m not thinking so much about the size or style of the estates but what happened to them. Both were built around the same time, both had glamorous histories, and then both fell in to sad states of disrepair in the 20th century when the two families money ran out. Ballyfin was sold to a religious order to be turned in to a boarding school in the 1930s while the Mahon family held on to Strokestown until 1979 when the house, which was a total mess, was purchased by a local garage for expansion of their business. Another big difference: All of the furnishings in the Strokestown Manor are original. Not so with Ballyfin. Which makes Strokestown more authentic, in some ways, although also a little creepy. For instance, cautiously make your way up to the second floor (the stairs are still a little iffy) and you come to the children’s room where you’ll find dolls and toys dating back to the Victorian era, including a collection of porcelain dolls slumping on chairs around a children’s tea set that reminded me of the Chucky movies from the 90s. Fleeing the room, I was certain the creepy little dolls, like ghosts in the house, were watching me. Porcelain dolls at the Strokestown House. Photo by David Lansing. 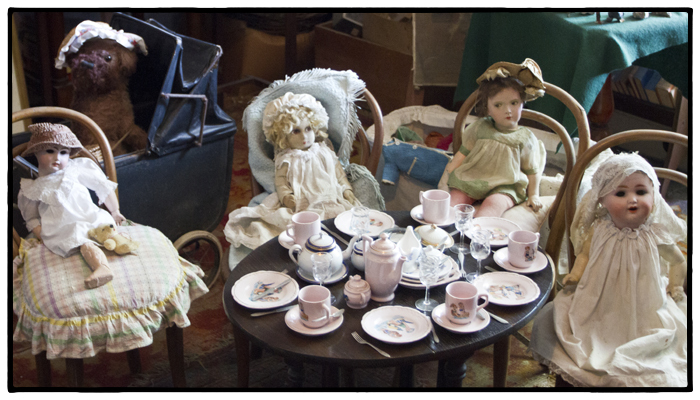 The doll, second on right, in the green dress does not look happy….I would not want to be in that room at night. The more I look at the photo, the more they all seem to be worrisome. That would be quite a story about the dolls evening tea parties. At high teas, water glasses similar to wine glasses may be placed above the knife. Okay, Barbara you win. Rosalia is truly creepy. And Fred, these weren’t water glasses. The curator told us that children in the house used to drink wine instead of water, right from birth, because there were no sources for clean water.